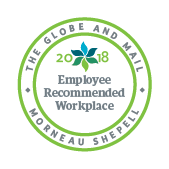 Util-Assist has earned national distinction as an Employee Recommended Workplace in a program developed by The Globe and Mail and Morneau Shepell. The program recognizes employers across the country that have prioritized a healthy and engaged workforce and have achieved the highest standards in workplace well-being. This designation reflects Util-Assist’s ongoing commitment to creating and growing a positive workplace culture. Util-Assist employees completed a confidential survey about working at Util-Assist and rated themselves on four pillars of total health: work, mental, physical and life. Upon completion, employees received a personal assessment that identified potential areas for improvement and provided them with links to resources to help them take action. Each employee was given a score based on their responses, and Util-Assist’s total score was compiled from employees’ aggregate results. The program is unique in that the designation is determined solely by employees: employees determine which organizations rise to the top and are recognized as Employee Recommended Workplaces. Research shows that engagement strategies can reduce staff turnover, retain customers at a higher rate and improve productivity. Util-Assist has worked hard on employee engagement strategies and providing a healthy and positive work environment. The results of the survey provide Util-Assist with metrics and valuable insight to continue to measure our progress in meeting these goals. Util-Assist has been invited to the Solving Workplace Challenges event and award ceremony in March and will use this opportunity to network with other companies to learn their best practices. Util-Assist is now entitled to use the Employee Recommended Workplace badge of distinction on Util-Assist’s website, on marketing collateral and in recruiting efforts. This badge tells current and future employees, as well as clients, that Util-Assist is an employer of choice, as declared by Util-Assist employees. For more information on the Employee Recommended Workplace program, visit www.employeerecommended.com.